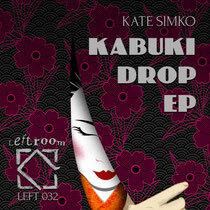 Hot on the heels of her collaborative EP with Matt Tolfrey, Kate Simko makes her full solo debut on Londonʼs Leftroom imprint alongside the vocal talents of Jem Cooke and the remix skills of John Tejada. A multi-talented musician and producer, Chicagoʼs Kate Simko has continued to flourish since her auspicious beginnings as part of Matthew Dearʼs Spectral Sound roster. Remixing Philip Glass, composing film scores, collaborating with Tevo Howard as Polyrhythmic and occupying a unique place in the world’s clubs via on-point DJ and Live/AV sets, Simkoʼs talents have been closely followed by Leftroom boss, Matt Tolfrey. After hearing the raw, acid-house electronics of ʻKabuki Dropʼ, Tolfrey signed on sight and itʼs not hard to see why. Simkoʼs love of Daniel Bell/DBXʼs incredibly focused and classic use of sound shines through on ʻKabuki Dropʼ, where an uncluttered rhythm track boldly drives an array of bleeps, atmospherics and gilded pads. John Tejada, an artist who has developed a reputation for squeezing soul out of machines, treats ʻKabuki Dropʼ to a decent makeover. The second half of the EP is balanced by ʻGo On Thenʼ, a full vocal cut and dub version featuring the sultry, jazz-inflected talents of London-based Jem Cooke paired with delicate Rhodes, lazy fills and hazy keys that underpin a powerful dubbed bassline.